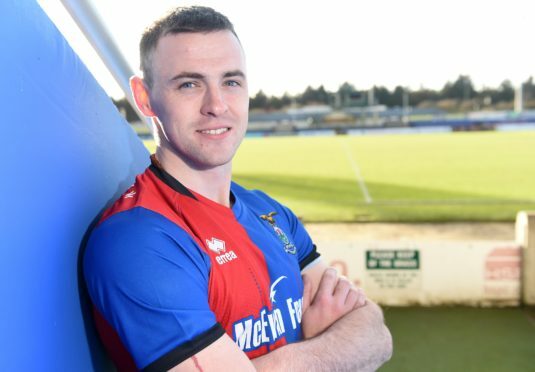 Picture by SANDY McCOOK 28th January '19 New Caley Thistle signing, Darren McCauley. Joining from Danske Bank Premiership side Coleraine in January, McCauley is making his first step into senior full-time football since leaving Derry City in 2011. The 27-year-old opened his goalscoring account in a 2-1 loss to Partick Thistle earlier this month, in one of four of substitute appearances so far. Robertson insists he is taking a patient approach in easing McCauley into full time football, with the winger due to complete his final year of a degree in nutrition at Ulster University before the summer. He said: “Whilst we might not see 100 per cent his best of what he is capable of this year, I think we will see a lot of flashes. He’s going to be a big player for us between now and the end of the season. I think he has a lot to offer. “He’s a very interesting character and in footballing terms we think he’s got more to give. He’s raw but he’s big and powerful. We think he’s quite a flexible player who can play wide left or right, or possibly even down the middle, but we see him primarily as a wide player. “We feel Darren is one of these late developers. He’s going to have to go to Belfast for a few Mondays over the next few months to finish his degree, which we will be helping him do. “I think that will help him. He has come in from part-time football, and has been just about all his life. Sometimes you bring a part-time player into full-time football and they struggle with the training. Robertson says he called upon the help of former Inverness goalkeeper Jonny Tuffey, now with Glenavon, in his pursuit of McCauley, who netted 17 goals for Coleraine in the Irish Premiership last season. Robertson added: “We have a couple of guys in Ireland who are very good, but the main guy I speak to is Jonny Tuffey. He knows the players, and their personalities and back stories. There have been two or three lads we have been interested in from Ireland, a couple that quite frankly because of the money the clubs were asking for were just well outwith our reach.